This week's tablehopper: sobriety checkpoint. 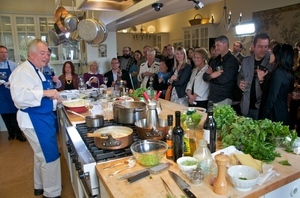 The scene at the Foodie Chap Chef Cook-Off; photo by Rick Camargo. Oh, it’s so FUN pretending it’s November in May! Can’t believe I have my space heater back on. Lame. But in the decidedly not lame department was my weekend. Saturday I was a judge in the the first annual Foodie Chap Chef Cook-Off at Mary Risley of Tante Marie’s lovely home (ends up Mary and I are both Alfiste: Alfa Romeo drivers). While Team Foodie Chap (Liam Mayclem, Roland Passot) edged out Team Rock Star Chef (Dominique Crenn, Russell Jackson) by one point for their cottage pie, the real winner was Food Runners: nearly $5,000 was raised for the organization. A big thank you to everyone who donated funds (and their time) to pulling off this fun event. As a reminder to all restaurants/event hosts/etc., no one ever has to discard or compost good, edible food—all you have to do is package the food and call Food Runners at 415-929-1866, and a volunteer or the Food Runner truck will come the same day to pick up the food and take it to an appropriate feeding program. Please remember this, thanks! Sunday was the annual Star Chefs event for Meals On Wheels, which raised another record-breaking $1.4 million dollars to help bring meals to homebound seniors. Incredible. And while it was pure torture to be there and not be able to eat or drink ninety percent of what was being served during the reception, I was definitely impressed with how many dishes I was able to make vegan by just asking chefs to leave the meat off their dish (it helped to have a friend with me who ate every piece of meat I gave him, and he fed me the garnishes). I was also thrilled to find out the vegetarian sit-down meal that night was prepared by the one-and-only chef Stuart Brioza (I was the sole diner at our table with a plate full of morels). It’s always a smashing event, kudos to all involved. Since I’m on the charity news circuit today, I want to thank the tablehopper reader who donated $250 to the CHEFS program, my charity of choice here in San Francisco. Made my week to hear that from the fine folks at ECS, thank you! Please remember SummerTini, the annual fundraiser for CHEFS, is coming up on June 10th! Okay folks, try not to let the rainy weather get you down. Just look at it as a free car wash.